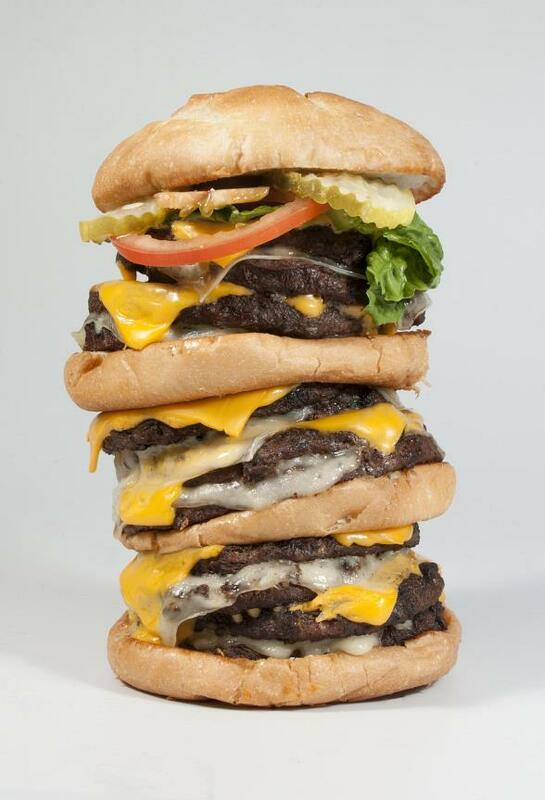 Fake Food Watch: Gigantic-Portion Restaurants: Corporate Profits at What Public Cost? Gigantic-Portion Restaurants: Corporate Profits at What Public Cost? Decadent, monstrous-sized servings were first a 1970s fad among restaurants, designed to entice and entertain Americans with chocolate cake slices the size of a human head, mountains of golden french fries, and burgers stacked taller than a small pet. It was great, unexpected fun 40 years ago. In 2012, rage-against-the-nutrition-machine propels Americans to eateries that serve gigantic portions of deeply satisfying comfort-food chocked with fats, sugars, and forbidden carbs. Rebelling against the nanny state never felt so freeing or acceptably naughty. Problem is... these eateries do it solely for the profit. And just like Big Tobacco, they don't give a damn about your health or public health. Or the health of our great nation. 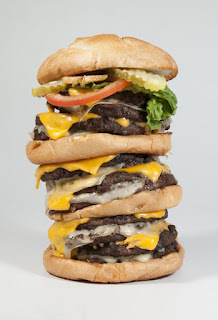 The infamous Heart Attack Grill, now in Las Vegas, is an easy nutritional target, with its Quadruple Bypass Burgers (up to 8,000 calories), all-you-can-eat Flatliner Friers (fried in lard), and Butter-Fat Shakes (triple butterfat in strawberry, chocolate, vanilla). Click here for a YouTube of a guy eating the butter pooled in a butterfat shake. Tony's I-75 Restaurant due north of Flint, Michigan where the "BLT has 1 lb. of deep fried bacon" and "the banana split has 1/2 gallon of ice cream." Top national chain restaurants are equally guilty of profiting from outrageously gargantuan meals sold to righteous calorie-rebels. Not far from Disneyland, Belisle's, which was open from 1955 to 1995, was famed in our neighborhood for serving volcano mountain strawberry pies, giant slabs of thickly frosted chocolate cake, 4-inch high meringue pies, and mounds of meatloaf and mashed potatoes with country-style gravy. One Belisle's customer fondly recalls gorging a "gigantic breakfast - you know, the one with a dozen eggs, a loaf of toast, a plateful of bacon, etc. Unbelievable!" "Trial lawyers met in Boston last month to discuss legal approaches to obesity, including lawsuits against fast-food chains and food manufacturers on grounds like false advertising, failure to provide labeling about caloric content or even fostering food addiction." Restaurateurs angrily respond by citing their first-amendment rights. When threatened for using the moniker "taste worth dying for" and dubbing scantily-clad waitresses as "nurses," Heart Attack Grill owner Jon Basso "fired back by saying that it was a matter of free speech." Restaurateurs also rightfully protest interference in their right in a capitalist society, in a free democracy, to sell what they choose to earn a living, as long as the fare is legal. I confess: I understand the heartfelt arguments both of public health officials and assorted nanny-state food police, and of restaurant entrepreneurs and corporations that earn rich profits by luring the public to gorge itself into heart disease, cancer and premature death. Here's what I don't understand: Why do Americans choose to visit these greedy food palaces? OK, once for novelty, I get it, and split the meal with friends or take two-thirds home for leftovers. But why patronize these public-health nuisances to the tune of hundreds of millions in annual U.S. sales? After all, the self-destructive gluttony meted out by gigantic-portion restaurants is no less harmful on health than the poison peddled to Americans by Big Tobacco. My favorite Asian restaurants London are a far cry from these kinds of restaurants. I think these businesses do contribute to this unhealthy culture, but they wouldn't remain in business if people didn't patronize their establishments. Food or even refreshments for example The french language fries, biscuits, candies, motherboards, snow cream, pastries, donuts, as well as food are generally referred to as palatable foods-they flavor very good and so they often generate pleasure as well as peace in many people. Signals to nibble on these food types comes by means of seeing, reading, smelling or even pressing thier food. The actual looks associated with another person Restaurants motherboards and the aroma associated with home baked brownies should bring again prior remembrances of the pleasures these foods stuck in storage as well as induce the desire to take all of them.